7 Speed Big Boy Prostate Massager..
Dr. Joel Kaplan - Perineum Massag..
7 Speed Cheeky Boy Prostate Massa..
Vibrating prostate-stimulator combined with perineum stimulation. 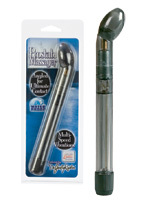 Designed with couples in mind, the Prostate Massager stimulates the prostate for more intense orgasmic pleasure. Firm, flexible, curved probe for stimulation of the prostate. Easy pull ring design.